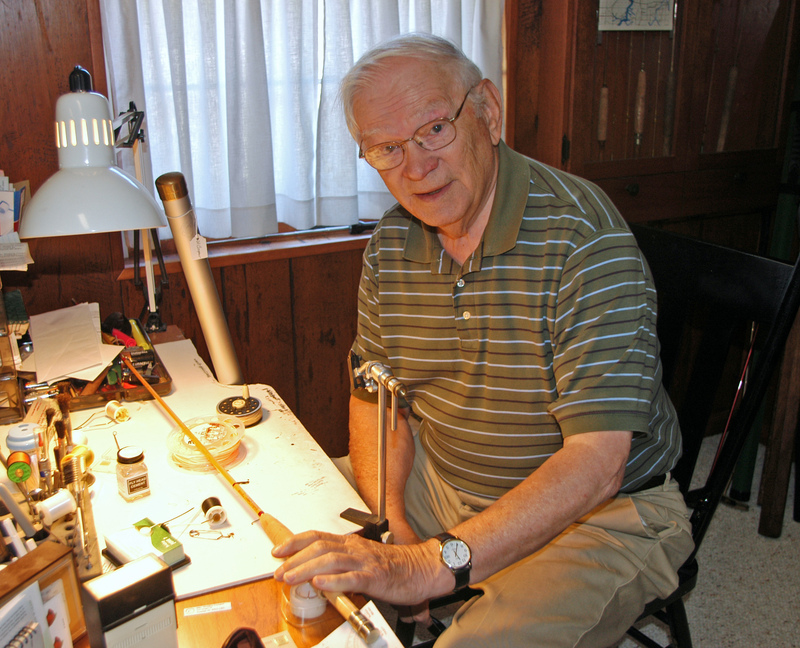 FREMONT, MI – In the quiet of his basement workshop, Wes Cooper has been keeping a 90-year-old Michigan tradition alive – that of hand-building bamboo fly rods in an era dominated by mass-produced fishing poles. 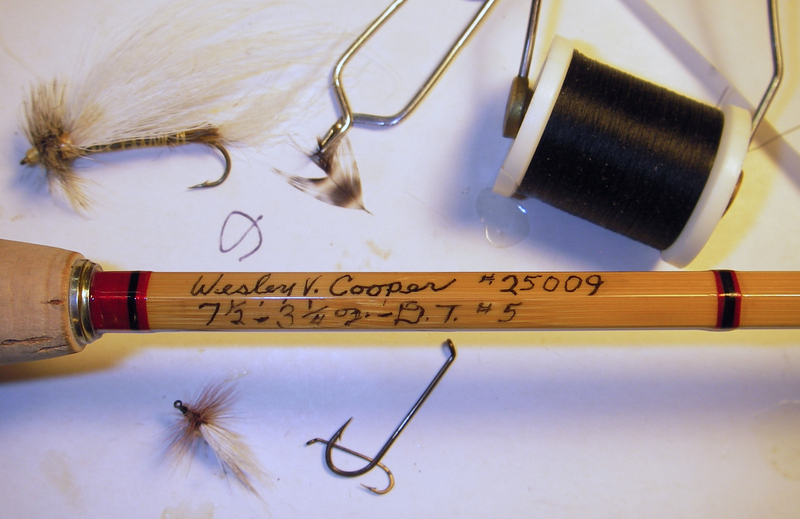 Cooper is a member of a small, but growing fraternity of cane-rod builders in Michigan, anglers who prefer the aesthetics, feel and performance of bamboo over graphite rods. And though some say ‘that is so yesterday,’ Cooper, now 85, says hardly the case. “There is a bamboo rod building renaissance happening in Michigan,” he says cheerfully. Cooper has mentored at least three young men in recent years that are likely to carry the torch lit in the late 1920’s and 1930’s by famous Michigan bamboo rod builders like Paul Young and Lyle Dickerson, icons among those who relish the rods. He meets regularly with a growing group of amateur and professional rod builders from around the state who share tips and techniques. “I like the way they cast. Its action is softer than graphite. It casts as far as I ever want to cast and handles fish beautifully” said Cooper, who will be honored for his work Saturday, Aug. 10, in East Lansing where he will be presented with a Michigan Heritage Award by the Michigan Traditional Arts Program at Michigan State University Museum, during the annual Great Lakes Folk Festival there. repairs. His rods sell for approximately $1,100. They require 50- to 60-hours to build. The most popular, has been his seven-and-half-foot, 5-weight rod, perfect for trout. Bamboo rods were the norm before fiberglass and early graphite rods in the 1970’s. Split-cane historians trace their origins back to the 1840’s. But they went largely out of style with the advent of modern materials, becoming collector’s items or antique decorations. Bamboo was seen as expensive, fragile and lacking the power that modern composite rods offered. Their resurgence has come slowly over the last two decades, largely the result of increasing numbers of aspiring rod-builders and the increasing availability of technical information and know-how. Cooper said bamboo rods offer all the power that most anglers need. He questions the need for the 12-foot, two-handed spey rods that are now the rage with big river fly anglers. Cooper’s first bamboo rod was a dime store model purchased for $3 in 1944. It wasn’t very good, he said, but he had been inspired to get one after spending time with his uncle, Ralph Cooper, an Ohio State casting champion in the 1930’s. “For some reason I idolized him and he fished with bamboo,” Cooper said. Cooper grew up in Akron Ohio. His family moved to Jackson, Michigan when he was 10 years old. He would eventually move to the Fremont area where he taught in the high school until he retired 30 years ago. But it was in 1959 that Cooper was fishing the North Branch of the AuSable when another angler talked to him about a big meeting in Grayling that evening. Cooper attended and became one of the first members of Trout Unlimited, the group that would form as a result of the gathering. Cooper’s first quality bamboo rod was a Paul Young rod he still owns today. It was wedding gift in 1951 from his wife Barbara, his partner for the last 61 years. The couple has three sons, and gaggle of grand and great-grandchildren. Cooper’s rods are result of a long building process. The bamboo comes from an area in China about the size of Newaygo County, he said. Cooper carefully splits pieces from the culm (stalk), shaves them precisely to create the right taper and glues them together before smoothing out the joints, adding hardware, signing and numbering them and finishing them. After 30 years of building rods, Cooper said he may retire from rod-building as an active commercial pursuit and build one now and then as people ask for one. “There are a lot of rod builders and they are good, he said. True, but there is only one Wes Cooper. This entry was posted in Uncategorized and tagged Artisan, Bamboo fly rod, Fish, Fishing, Fly Fishing, Fremont, Lyle Dickerson, Michigan Heritage Award, Michigan State University, Michigan Tradtional Arts Program, Paul Young, Trout Unlimited, Wes Cooper, Woodcraft. Bookmark the permalink.